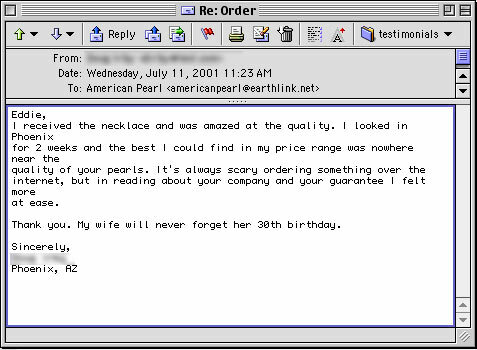 At American Pearl, we understand that purchasing an expensive strand of pearls for a loved one using the internet can require courage. How can one purchase an item without seeing the product or earning the trust of the seller? 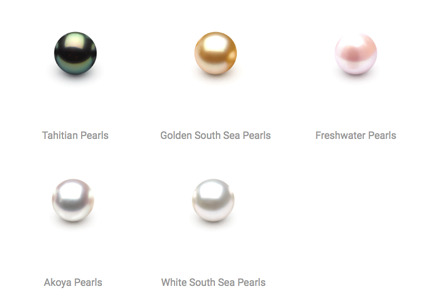 � Are the Pearls Top Quality? � Am I Truly Purchasing At Wholesale Prices? 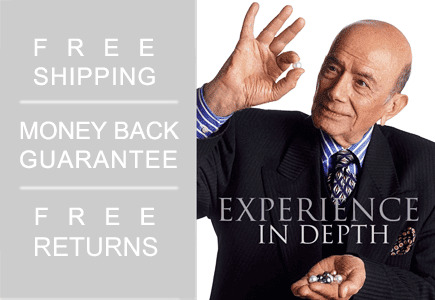 � How do these Pearls Compare to Mikimoto? 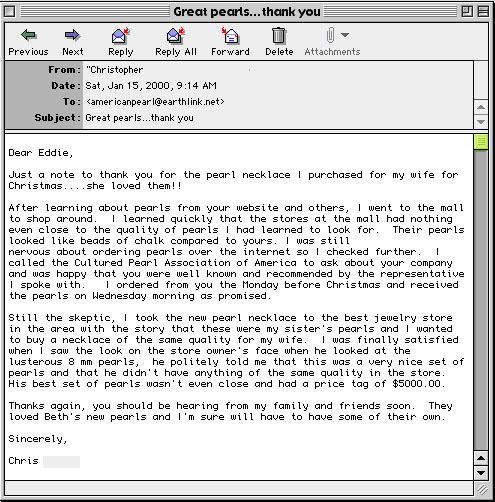 � What Will These Pearls Appraise For? 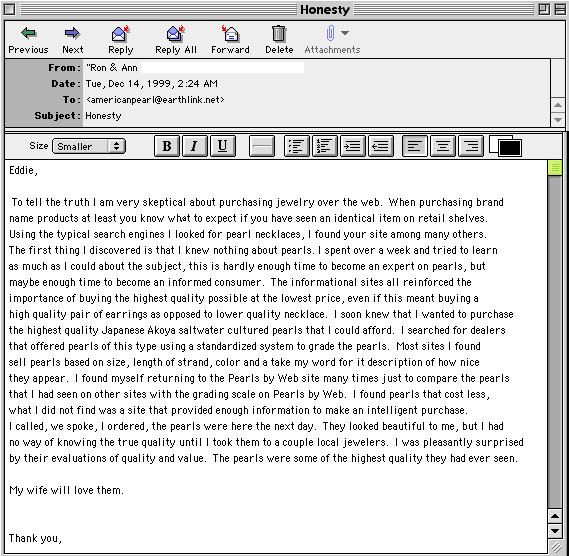 � Can I Buy These Pearls For Less? 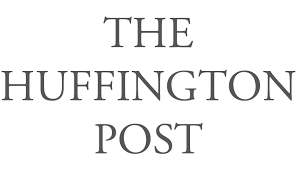 This story starts during the 1960�s in Connecticut, when, as a teenager my Mother came home from a trip to New York City with a beautiful Pearl Necklace. She was thrilled since these were of the finest quality, and, always practical, had never believed in expensive jewelry. She told me that my Dad had found a special jeweler who dealt only in Pearls, and had made a gift of them over a romantic dinner the previous evening. As a teenager, I was generally more interested in flying small planes, than in such things as Pearl necklaces, but I did remember she said that the Jewelers name was Charlie. It�s amazing what you remember in life. Now we will fast forward 40 years later, and late in the fall of 2005 I went on a quest to find a special Pearl necklace for the love of my life. I knew precisely what I was searching for, but I found that most Jewelers really don�t seem to understand Pearls. 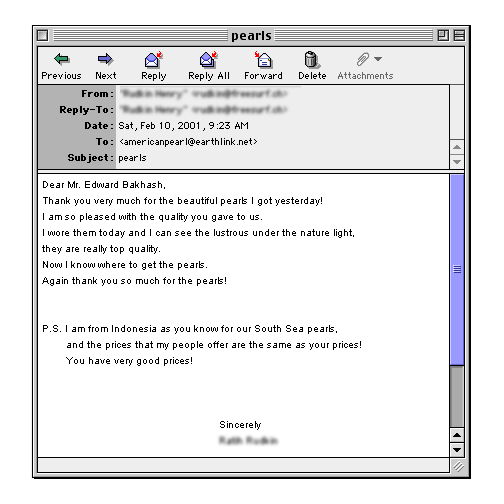 From my trusty computer I researched various internet sites about the subject and came upon this place called American Pearl. 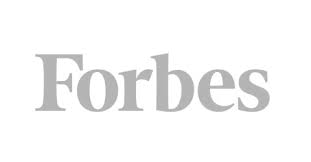 Just by chance I noticed that there was a profile of the company�s founder, and being interested, clicked on the picture. The biography was interesting and confirmed to me his Pearl Pedigree. It suddenly hit me that his name was Charlie. Not wanting a mundane necklace, but a specific arrangement, I called the store in Manhattan. I was delighted to find that the founder�s son had assumed the reins of the business. Eddie was the expert for whom I had searched, and I immediately knew he could be trusted to produce the special piece which I desired. Not only did he produce this necklace, but he personally delivered it to my hotel in Mid-Town, before my arrival, so that the gift could be a romantic surprise. 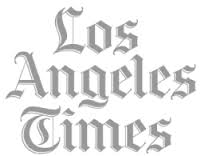 In the meantime, I mentioned the coincidence of his Dad�s name, and my story. After some discussion, it seems that two generations of my family have now purchased a gift of great love from this fine and expert family. As a postscript, my love and I went to the store to meet Eddie, and pick up some matching studs. To my great surprise, and delight it seems that a great circle was completed when �Charlie� (Who is only there rarely) emerged from an office to meet us. I cannot begin to thank these fine people for their kindness, professionalism, and of course, the unanticipated continuation of a family tradition. Body: American Pearl is among a handful of retailers in any field that I would recommend unconditionally. On the third occasion, I purchased APs Weekly Special - a 9 x 10 mm Multicolor Freshwater Pearl Necklace - as a birthday present for a family friend; another great success, with the added bonus that the recipient thought I had spent far more than I had (she felt so guilty, though, that I had to tell her the real price: Under $300 with the discount. 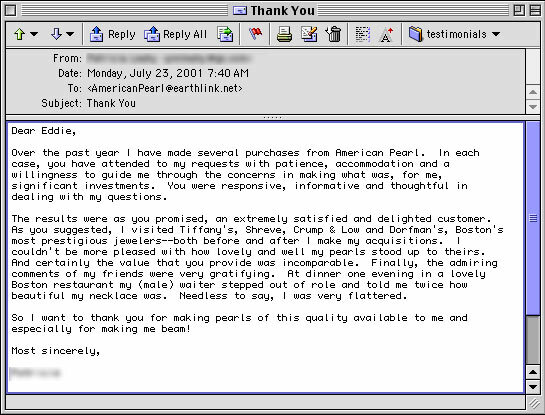 (see http://www.americanpearl.com/weeklyspecial.html) Aside from a high-quality product at an excellent price, AP excels at customer service. 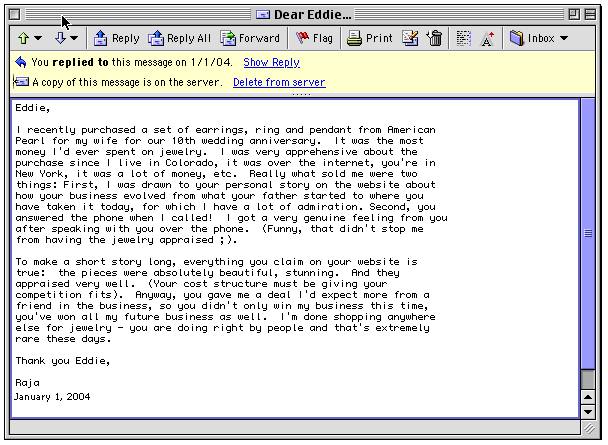 Since I work near their Fifth Avenue office, Ive had the pleasure of dealing with Eddie Bakhash in person. Hes a great guy, very passionate about his field, and happy to educate curious customers about oyster esoterica. Everything is fully guaranteed, and the packaging and paperwork is beautifully presented. I cant comment on shipping, because I have always picked up the merchandise in person. I gave AP top marks for Shipping Options and Delivery anyway, because Eddie has been so accomodating about the timing of pickup. 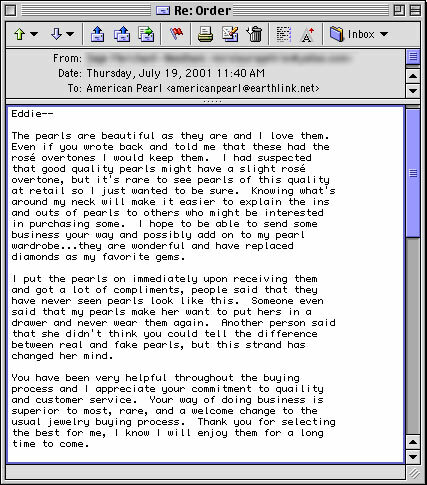 In short, American Pearl is - if you will pardon an obvious pun - a rare gem. 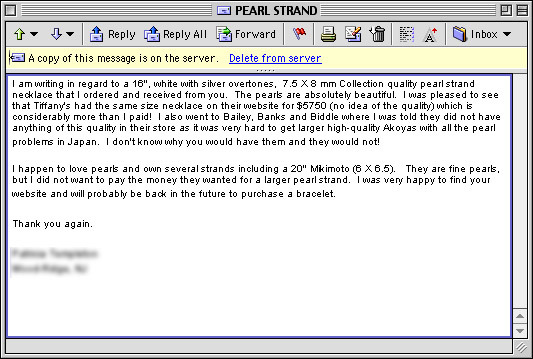 Thank you for making our experience of buying pearls such a special occasion. 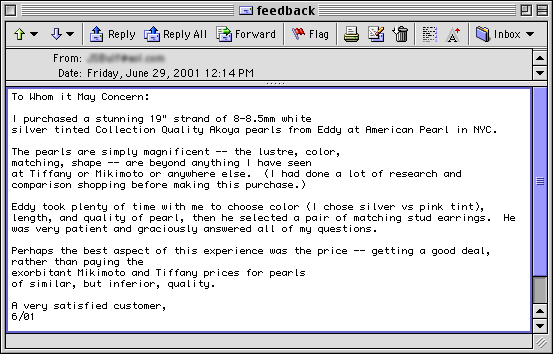 I was thrilled when Stephen told me he wanted to buy me a pearl necklace for my 40th Birthday. I have wanted a string of pearls for many years and knew it would be a once-in-a-lifetime experience. 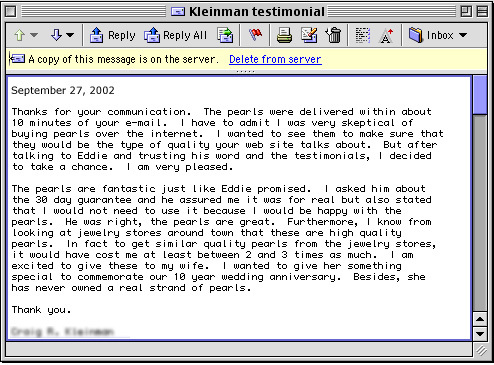 The quality of your pearls and your fabulous service ensured the perfect day! I will always remember being in New York and buying pearls from you on 5th Avenue as one of my most special memories. I do appreciate you organizing the matching earrings so quickly and the set looks lovely.Please also thank Leah for her superb work stringing the pearls. I suspect the experience will not be once in a lifetime after all. 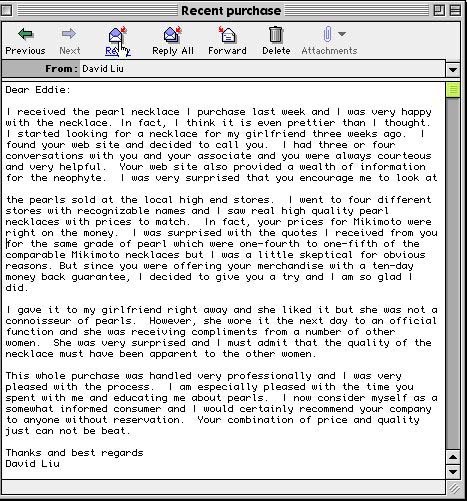 I had the good fortune to work directly with Eddie of American Pearl on the purchase of a Collection Quality 16 pearl necklace as a gift for my wife on our tenth anniversary. The experience was exemplary in every way. 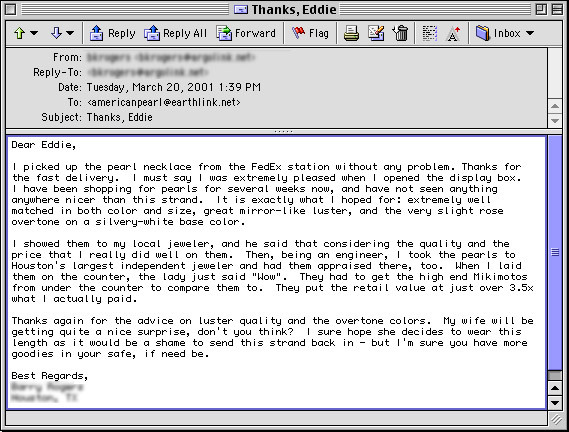 Eddie and his staff were patient and professional, explaining various the options and trade-offs in selecting pearls. He encouraged me to visit his big-name competitors, which I did. 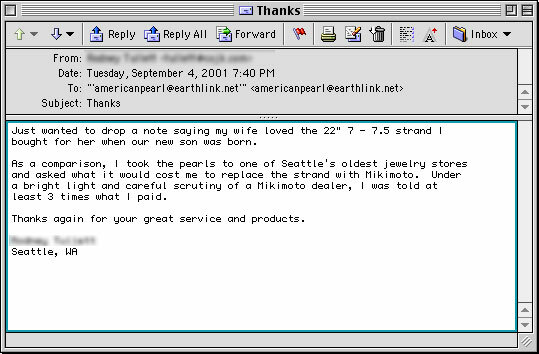 Apparently, a research trip to Mikimoto and Tiffany nearly always leads to a customer returning to (and buying from) American Pearl. The pearls are magnificent, my wife is ecstatic, and I have the satisfaction of knowing we got the very best at an extremely fair price. Being treated with respect by a firm that takes its product and services sersiously is a rare treat. 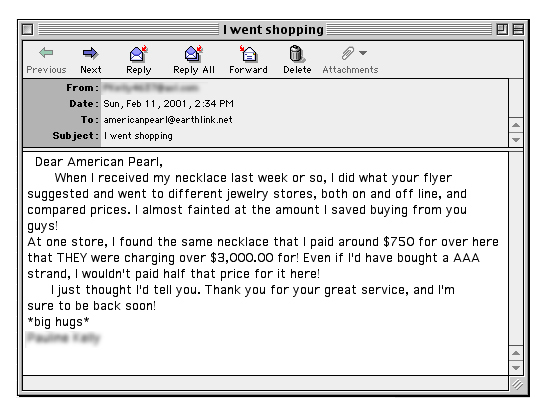 I would recommend American Pearl to anyone interested in purchasing pearls. I also recommend their website to anyone who simply wants to learn more about this extraordinary product of nature. As a returning customer, I am always amazed at the beauty and quality of your pearls and pearl jewelry. One must see for themselves the absolute beauty of your pearls. The quality is as good, if not better than, Mikimoto and Tiffany & Co. Also, I appreciate the integrity of your staff! 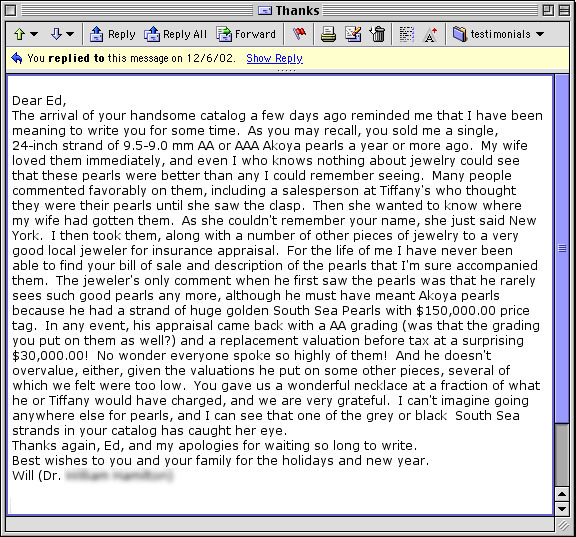 They are honest and forthright when asked specifics about pearls and pearl jewelry. I have always been treated with the utmost respect and patience when making inquiries. Your customer service is beyond reproach! Thank you! 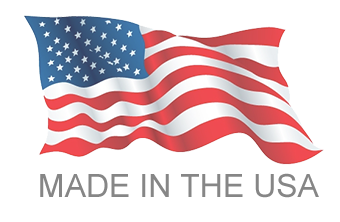 I rated delivery a 5 so as not to leave blank and reduce the rating; however, I was to be in New York and was able to pick up my order at American Pearls offices. I was pleased with the AAA pearl earrings. 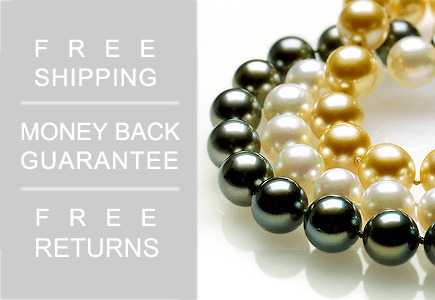 You may find prices a little less but you probably are not going to get pearls that are as-advertised quality. 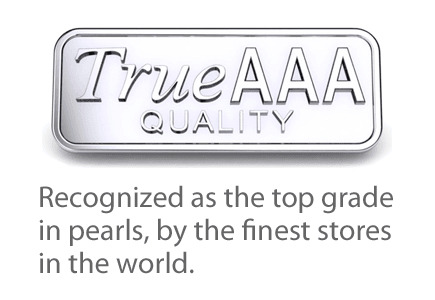 The A to AAA ratings of pearls is abused, in my opinion, by many retailers. After checking a number of websites, and looking at the stock of a number of storefront sellers, I decided to follow the advice of a wise friend. 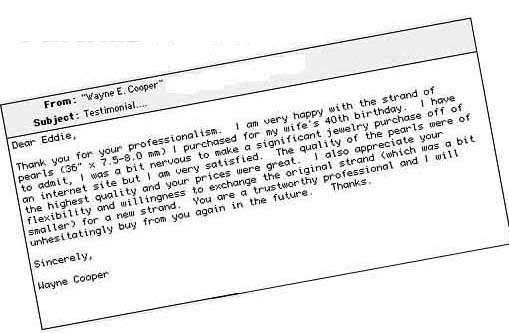 He suggested I deal with one of the New York firms who had a long history of dealing in that very competitive market. American Pearl has been around for many years and is now operated by the second generation family. Their offices are right on the corner of New Yorks diamond district. You just dont survive the market there if you sell junk. I was glad I saw APs offices, and presentation rooms. Very professional without a lot of glitz. The product spoke for itself. The pearls I got are so much nicer, in every respect, than anything else I looked at. I also was able to get the more secure screw-backs here. I think you will also be impressed with the fact that these folks put their street address right on the website - unlike so many others. The phone is answered, many times, by one of the owners. I am difficult to please and usually have many questions. I know I called them five times in the same day and was never rushed. 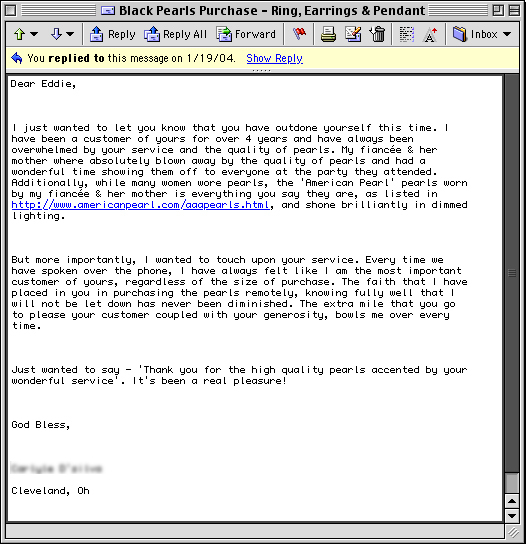 They even addressed my concern for their 30-day return period running out because I got the pearls in November for Christmas. One of the family owners sent an e-mail to me to extend the return period so my wife would have the full 30 days to consider her gift. 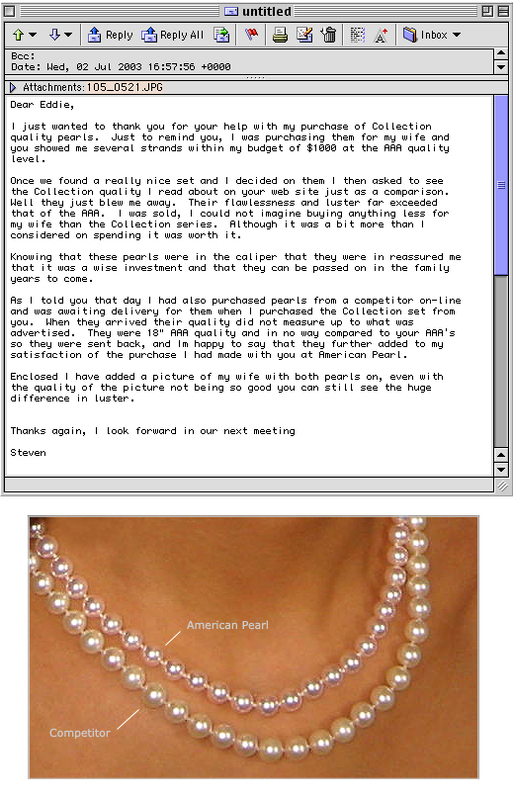 I have no doubt she will cause me to contact American Pearl again - to get a matching necklace.